Have you or a loved one suffered a serious infection after undergoing a joint replacement or implant surgery? The FDA first approved the Bair Hugger warming system in 1987 by way of a premarket clearance program, 510(k), which allows a device to hit the market without clinical proof that it is safe as long as it is similar enough to a device already on the market. Originally developed by Dr. Scott D. Augustine and sold by his company Augustine Biomedical and Design, which later changed its name to Arizant and was later purchased by 3M, Bair Hugger Therapy has been used on more than 180 million patients and is employed by and estimated 80 percent of hospitals in the US. 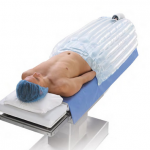 Bair Hugger Therapy uses forced air warming to prevent and or treat hypothermia in patients during surgery. Hypothermia occurs when the body is losing heat faster than it can produce it; almost all surgical patients become hypothermic during surgery which can lead to blood loss and infections. 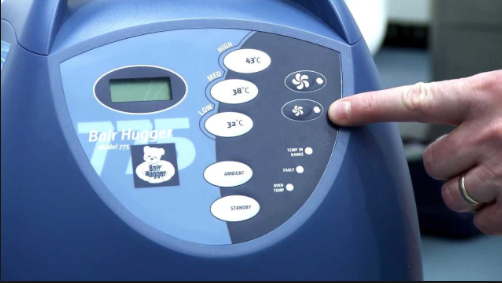 The Bair Hugger units filter the air, and then force warm air through disposable blankets that are covering the patients. In addition to warming the body through the use of warm air, they are designed to help prevent heat loss from evaporation by wicking moisture from the body. 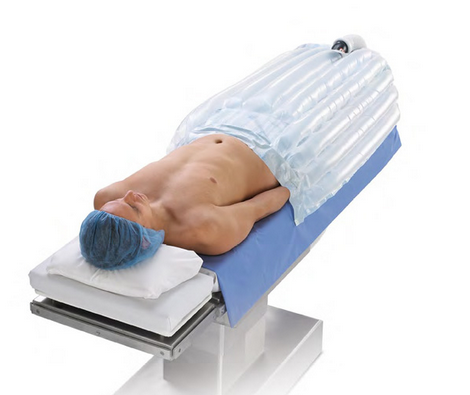 In order to reduce patient to patient infection risk the blankets are disposable. While Dr. Augustine is proud of his products he has recently become outspoken regarding the risk of infection resulting from the use of the Bair Hugger system, particularly during implant surgeries such as artificial hips, knees or heart valves. A viewpoint which is supported by several studies in recent years. Despite its popularity as a warming device during surgery, numerous studies have recently explored the link between forced air warming units like Bair Hugger and increased risk of infection including deep joint infections. Even the creator of Bair Hugger, Dr. Scott D. Augustine, has come out against its use in certain surgical procedures such as hip, knee and heart valve replacements. In November of 2011 a study was published in The Bone & Joint Journal which showed a significant increase in deep joint infections when force air warming systems were used as opposed to other warming devices during simulated hip replacements and lumbar spinal procedures. In February of 2013 another study published in The Bone & Joint Journal showed that researchers found the use of forced air warming devices caused contaminated air to be sucked up from the operating room floor and deposited over the surgical wound. According to the study 2,000 more contaminated particles were found in the air over the wound with Bair Hugger than with the conductive warming device. More recently in the August 2013 issue of Anesthesia & Analgesia another study was published concerning the increased contamination in the surgical field from the use of forced air warming. The study showed that the forced air warming devices caused a disruption in the ventilation air flows of the surgical site leading to added contamination. Deep joint infections can lead to multiple to severe complications. Patients who suffer from deep joint infections may endure extreme pain and suffering, additional revision surgeries, permanent disability and treatment costs in excess of $100,000. If you or a loved one are suffering from these symptoms and have recently had a joint replacement or heart valve replacement surgery with a Bair Hugger warming system, you may have a claim. Some victims of these severe post-operative infections have started to take legal action against Arizant and 3M. Various lawsuits have been filed across the country claiming that 3M and Arizant knew of the infection risks, but failed to warn about the risk of infection involved with the use of their product. Many of the plaintiffs in these lawsuits claim to have suffered serious deep joint infections after the Bair Hugger was used during their hip or knee replacement surgeries; often times requiring additional surgeries and leading to a prolonged and painful recovery. One such lawsuit was filed against 3M and Arizant in the U.S. District Court, District of Kansas. The plaintiff in this litigation is claiming the use of the Bair hugger caused him to develop a deep joint infection after undergoing a knee replacement. The infection was so severe that it required several revision surgeries before eventually requiring an amputation. The number of lawsuits being filed against 3M and Arizant continues to grow. Currently, there has been a request made to consolidate all the lawsuits filed in federal court under one federal multidistrict litigation (MDL). The step to consolidate under an MDL is usually indicative that there will be numerous lawsuits filed. We represent our clients on a contingency fee basis. This means that if we do not win your claim there will be no obligation for you to pay us. The only way we are compensated for our services is if we are successful on your claim. A successful outcome on your claim could entitle you to damages for medical expenses, wage loss, pain and suffering, loss of enjoyment of life and loss of consortium. We would love to discuss your options further. Contact us today for a free consultation. We would like to speak with you. Our representatives are standing by 24 hours a day, seven days a week to hear about your story. Call us now, and find out if you qualify for a potential claim. Call today, do not wait until it is too late.